Bright Bold Colors! Magnificently modern design! Join us as we learn about the versatility of the Creative Grids 60 Degree Diamond Ruler as we bring to life "FanFaire" by Krista Moser. This month we are going to learn how to turn a picture into stitches. Have you always wanted to learn to quilt but you aren't confident enough to jump in ? If you have no sewing or quilting experience, this is the place for you to start. If you have sewing and/or quilting experience, this is also the place to start to confirm what you already know and to fill in the gaps of what you need to know about making a quilt. Saturday Sampler Skill Builder, Register Here! Bring your project and come Embroider with friends. 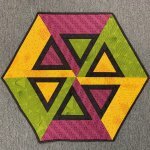 See what others are working on and get tips and tricks from other Embroiders. A quick geometric table topper using a 60 degree triangle ruler. A Nancy's Calico Patch CHALLENGE. This challenge is a little crazy! Grab your hard hat and needed tools to construct your perfect neighborhood. Using your scraps (or ours) piece together your favorite houses, your neighbor's homes and maybe a home or two for Fido! Kids Quilt Camp is for ages 9-14 who have completed the Beginning Quilting Class. Come join in the fun summer quilt camp for kids. In this 4 day camp we will making the quilt top only. "Scrap Nuts" for quilting fun and stash demolition. Scrap Nuts is an opportunity to get together with like minded quilters who enjoy the challenge of creating quilt tops from a great variety of fabrics from our stashes. Exchanging scraps and buying new fabric is always an option. We will have monthly specials. Our monthly get together for sewing, friendship and fun! A whole day to spend sewing with your old friends and some new ones, too. You bring your machine, supplies and projects and we provide plenty of space to spread out, support, advice, encouragement and entertainment, too! Come join us for 4 fun filled days of sewing and prizes and lunch on Sat. Bring your own projects and sew with your friends and make new friends. Fresh, Fun, & Funky A wonderfully whimsical collection of fabric, wool felt & techniques, Urban Owl is sure to be the talk of the town!